In the modern university, there are constant pressures to be more productive and to reach more students in an economical manner. Concurrently, technology has advanced to the point where the reach of an individual instructor or course can be greatly enhanced, allowing a larger number of students to learn and develop skills. At the same time, the quality of learning, one of the essential elements of the university is often disconnected from productivity. Teaching faculty often believe that an increase in class size will result in a diminution of quality and a restriction on the ability to offer active and engaging instruction. They often believe that with large classes, instruction must be didactic and lecture based, focusing on the delivery of information. In my own classes, I have found there are great opportunities for educational enhancement that come with scale and with increased use of technology in helping students learn. The promise of educational technology is to improve all education, particularly in terms of higher order skills. This writing seeks to chart some of these advancements and their potential, and it focuses on my principal course, Creative Problem Solving. It is an entry level course that deals with the development of creativity and problem solving skills. Students from a broad range of disciplines have taken the course, and creativity is seen to be an important skill for the 21st century for all fields of study. The course is not about creativity, although that knowledge has become a strong part of the class. It is about becoming more creative, and that skill, like other personal traits, is something that makes the course worthwhile for all students. Visual text analysis through a concept cloud, an online tool from http://textisbeautiful.net In a concept cloud, concepts are grouped into themes designated by color; size denotes frequency. At the center of the course is a focus on the development of the individual learner. From the beginning the course has had a focus on the learner, with themes of creativity, critical thinking, and constructing one’s own knowledge. Students learn to be creative through their own efforts and specifically by being creative. A large part about becoming more creative deals with divergent thinking. Divergent thinking is the ability to invent a wide range of responses for a given challenge, often overcoming internal censorship or restraint. Inherent, though, in the field of creativity is the concept of convergent thinking, on selecting the best answer and improving that answer for the best results, which are also central aspects of critical thinking. Students do learn for themselves, constructing their own knowledge from their experiences; we as teachers can help them through the learning activities of our courses. In helping students develop creativity, we’ve tried to get students to challenge their own assumptions and to continually develop new sets of ideas for any situation. Central to the development of creativity is the active participation of the learner; the projects they complete require personal involvement; they must eat something different, they must talk to someone new in person, and they must engage others in their efforts. By being consciously creative in the solution of modest problems, learners develop their own creative habits, and an ability to address more significant challenges. I’ve had the opportunity to teach the same class at multiple sizes, and in each case, the change in scale has resulted in numerous, qualitative improvements. From each level of the course, lessons have been learned which, continued, have enhanced the course at the next iteration. With the initial seminar, learner efforts were personally reported to a small group of their peers; in the lecture/discussion format, materials are collected online, but discussion and critique still occurs in the discussion sections. With the next change in scale, to the “massive” level, online structured peer evaluation will encourage the development of critique skills for all students. Not only will the projects challenge the learner, but evaluation of the projects will help develop their ability of evaluation. At all levels of class scale, the content of the course is generated by the learners themselves, and they are involved with discussion, critique, and idea development. And logically, the knowledge developed springs from their own construction. One of the leading details that makes the course scalable is not that it’s about the distribution of information, but rather that we’ve developed a way to scale active learning through the use of technology. Currently, we collect images for every assignment, images of the learners doing inventive and creative tasks. In a small class, showing images of the work was seldom done, whereas with 100 students, it has become a necessity…made possible by course management software. Similarly, with 15 students, there was no need to utilize rubrics to guide teaching assistants [as there were no teaching assistants]; with 100 students and four teaching assistants leading discussion sections, rubrics are essential components of our teaching effort. Logically, with 1000 students, it will be necessary to have structures for peer evaluation of the work…which will also help students learn to critique themselves and others. My upcoming project is called SMOOCH, which stands for Semi-Massive Online Open Course, Here. It uses MOOC technology and theory to present a course on Creative Problem Solving. We will be targeting the entire University of Minnesota entering class for a for-credit, online course in Summer 2014. Students will be able to take the course as part of their Fall 2014 tuition and will develop the most essential skill of the 21st Century, creativity. 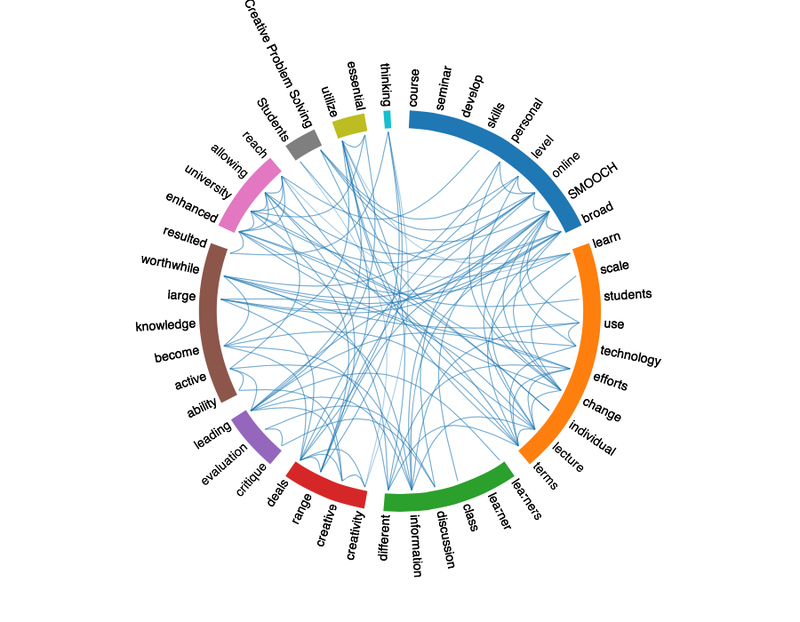 Visual text analysis through a correlation wheel, also from http://textisbeautiful.net In a correlation wheel, concepts are grouped by theme/color and lines denote connections through the full text. Shifting from a small intense seminar to a moderate sized course generates a much wider range of student input and production. The scale can also allow for multiple concurrent discussions or deeper group activities, either in person or online. 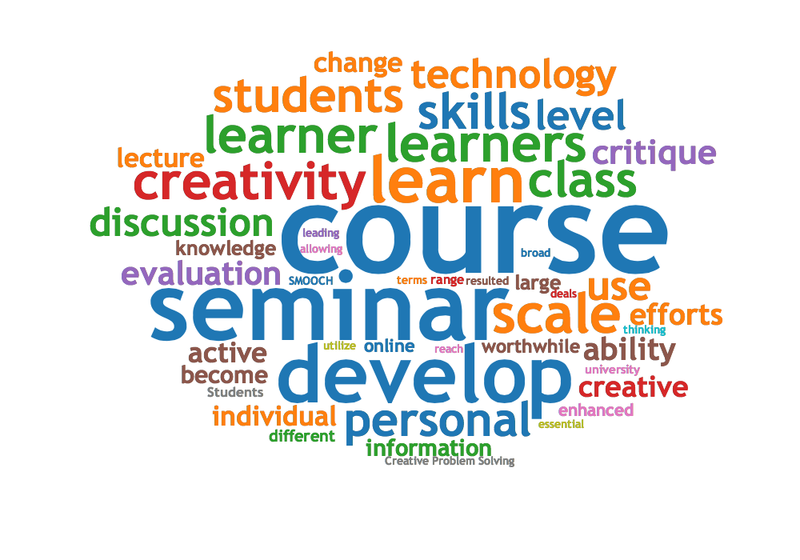 Larger lecture courses have a different dynamic and must also be thought of as a designed learning experience. With a larger course, it becomes effective in terms of cost and effort to utilize more technology. Additionally, the very large course would also necessitate the use of peer-evaluation in the course; this will help each learner to develop their own metacognitive skills of critique and analysis. It is also worthwhile to ask what can be learned from changes in technology and scale for use in our smaller classes. What we will learn from creating SMOOCH should benefit the seminar; the large lecture and use of broad based data can inform our more moderate sized courses. The shifting of some of the details of education to the learner, such as self evaluation, of carrying discussion to greater depths, or of using a more diverse media for accessing information can all have a beneficial effect on the individual learner in the small class.